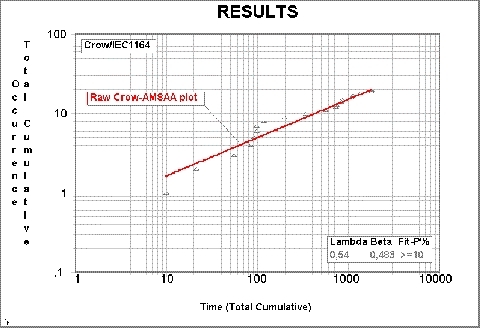 The Crow-AMSAA method makes it possible to monitor and assess your Reliability Growth Process. This includes the Design and Testing follow-up process implemented in your Company. 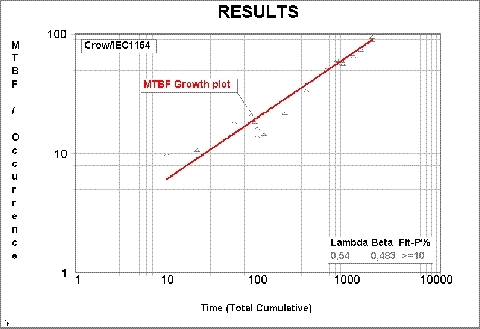 The Crow-AMSAA basic plot can easily be transformed to MTBF plots or Failure-rate plots. The same data as shown in the above plot is transformed to MTBF in the plot below. Statistical Confidence Bounds can easily be added on all plots, showing 90% Upper and Lower expectation levels. All methods and tools are available in the WinSMITHWeibull & Visual Software. Within the 4 day Weibull Reliability Engineering Workshop will learn you ALL the methods and you will be able to analyse all Reliability issues on your way without further study and other Software.